We are bogged down by words these days. Whether we enjoy reading or watching the news, watching television or movies, or reading books or blogs, words are thrown at us. So. Many. Words. Some words are truthful while others are stretched and sometimes, untruthful. Both the spoken word and the written word have the power to shape us, destroy us, guide us, encourage us, or completely confuse us. There is one Word; however, that is constant—God’s Word. We run around from here to there looking for answers, the next best thing, a word of encouragement, a source of inspiration from someone or someplace. We talk amongst ourselves, and sometimes we talk to ourselves. But God said, “Listen to Him.” The Him being Jesus. As we venture further into the Gospels, we see Jesus performing miracles, healing people, teaching people, eating with sinners, raising people from the dead, speaking in parables, declaring He is the Son of God and calling the twelve disciples. According to historical scholars, it was approximately fifteen months from the time Jesus was baptized until He called and sent out the twelve disciples (Mark 6:7 and Luke 9:1). The disciples went out and did many things in Jesus’ name, and they returned to Jesus shortly after that and reported to Jesus all that took place. Just four months after the miraculous feeding of the five thousand, the Transfiguration took place (Matthew 17:1–13, Mark 9:2–13 and Luke 9:28–36). At Jesus’ baptism, the voice of the Lord was heard by all who were present; however only three disciples were present at the Transfiguration. A cloud overtook the disciples, and they were gripped with fear (Luke 9:34), and a voice from the cloud said to them, “This is my Son, my Chosen One. Listen to Him” (Luke 9:35). God chose only three to hear His word—Peter, John, and James—and after they heard these words, Jesus told them not to tell anyone what they had seen (Luke 9:9). Oddly enough, the next day after Jesus delivered a boy from demonic possession, Jesus made this statement to the disciples, “Listen to me and remember what I say, ‘The Son of Man is going to be betrayed into the hands of his enemies’” (Luke 9:43–44). God told them in the cloud to listen to Jesus, but Luke 9:45 says, the disciples had no idea what Jesus meant by His statement. The significance of what was said to them, according to Luke, was hidden from them so they couldn’t understand it. Why would God tell them to listen to Jesus, but then hide what was said from them? Jesus’ ministry continued for approximately eight months after the Transfiguration. He continued to perform miracles and teach. He raised Lazarus from the dead. He healed the sick and forgave sinners. The disciples were with Him as he taught and preached. They were hearing what Jesus had to say, as were all those who came in contact with or heard about Jesus. But, words and concepts were hidden from them. They, like Mary, had to hide what the Lord said to them in their hearts. They didn’t have the luxury of the recorded Word of God that they could read over and over and over. They had to replay what the voice said to them at the Transfiguration, “Listen to Him.” Confusion and fear gripped them so much that although they may have talked amongst themselves about what Jesus said, they didn’t ask Him about it (Luke 9:45). The Bible makes it clear that only those who possess the Spirit understand spiritual things (1 Corinthians 2:14). God reveals Himself through His written Word (known as special revelation). And just like with the disciples, God reveals things to us in His timing for His glorification. If we never pick up the Word of God but instead seek the words of others rather than a word of God, we miss out on His richness and gift to us. We must listen to Him more than we look to others. What does this look like for us today with words coming at us at the speed of light? 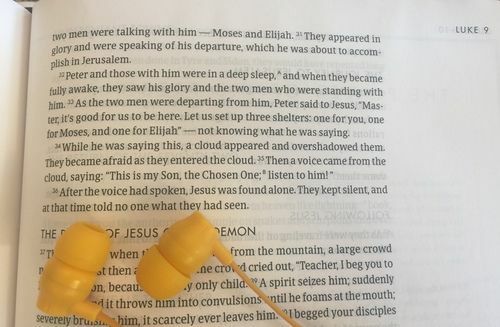 It is moments of time spent in God’s Word with noise-blocking headphones on our ears and horse blinders on our eyes (figuratively speaking, of course). We need to block out the chaotic noise of the world and the visual pull of other things and focus on what God alone wants to convey and reveal to you. Remember, Jesus told the disciples not to say a word about what they witnessed at the Transfiguration until it was time. God’s timing is perfect to accomplish His will. God’s Word is alive and it never becomes old. You may have read the Bible from cover to cover several times in your lifetime already, or perhaps you’ve only read a few Scriptures. Regardless, if God speaks through His Word, we must listen. Jesus spoke a lot during His earthly ministry and His life-saving words pertain to each one of us today. His instruction also includes information about what it looks like to participate in the kingdom work of God…just in case you need a healthy reminder.